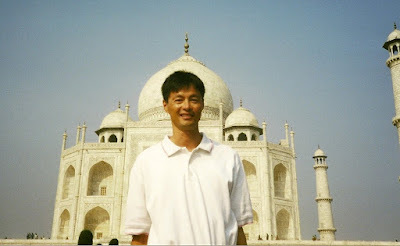 The Taj Mahal, the very symbol of India in the West, is the perhaps the world’s greatest monument to love. 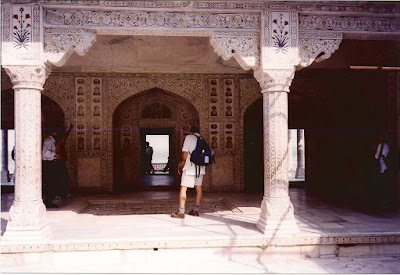 It was built by a Mughal emperor as a final resting place for his adored wife. And though the structure is still one of the most beautiful and recognized buildings of our time, it was responsible for the downfall of that very emperor who had it built. We've had the pleasure of visiting this magnificent monument twice, but the first time holds the most striking memories. The day started long before dawn, in the courtyard of our hotel in Delhi, where we boarded a dilapidated taxi that would drive us to the Taj, four hours away. 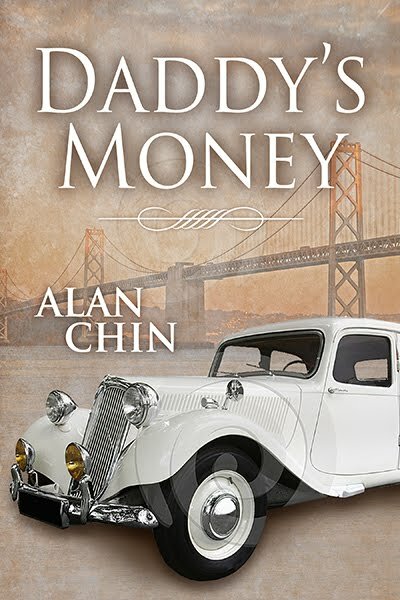 Our driver – a man in his thirties whose hair was coal black, his skin the color of walnuts and his teeth the color of old wax – spoke very little English and he drove like the proverbial bat out of Hell. He had two speeds while driving: full go and full brake. Seriously, either brake or accelerator, it was peddle to the metal. By the time we left Delhi and flew along the open highway. I began to jokingly call him Rambo. As we cruised through the countryside, we found that the local villagers used the highway to travel from village to village, with no heed to traffic laws. Indeed, speeding along in the fast lane of a four lane divided highway, we often encountered something in our lane, coming at us and going in the opposite direction: camels pulling carts of hay, old men on bicycles, children driving herds of goats or sheep, etc. Once we even stared down an elephant who looked ready to charge our little taxi. All this didn’t really surprise us, but what did unnerve me was that our driver was reluctant to slow down even one iota. He would lay into his horn from a quarter-mile away and hold his speed no matter what. We had so many near misses in the first hour that I couldn’t look out the front window any longer. 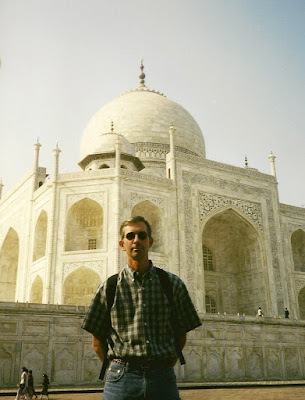 Once we reached the city of Agra, our driver pulled into a huge parking lot packed with tour buses, where we mingled with Germans, Brits, French, American, and Japanese tourists, all bargaining with guides. Our guide, Mr. Krishnan, a man with snowy white hair and a pleasant smile, leaned heavily on a teak walking stick while we puttered along. He spoke perfect English with a British accent. He led us to an electric bus – no combustion engines are allowed within two miles of the Taj in order to reduce the effects of air pollutants eroding the monument’s marble. A few minutes later we passed through what looked like the poorest of slums, to the towering thick walls and the Jilo Khana, the red sandstone gateway. The Taj Mahal is surrounded by the red sandstone walls on three sides, and the fourth side is protected from entry by the Yamuna River. The gateway is massive. Imagine a doorway four stories tall and half as wide. We quickly paid the 100 rupee entrance fee – less than $2 each – and were allowed to slip through the massive Juilo Khana. 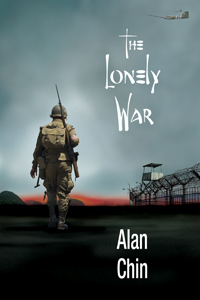 It was a jarring transformation, like stepping through the looking glass, moving so quickly from slum to splendor. Once inside, Mr. Krishnan led us to an expansive, immaculately manicured garden, and at the far end of a long fountain, stood three buildings. The center building, the central tomb of Begum Mumtaz-i-Mahal, seemed to float in space, its massive dome soaring up towards the heavens. Heat waves radiating from the white marble diffuse its focus. We stood stock still for several minutes, taking very deep breaths and shading our eyes against the brilliant glare. Our guide, Mr. Krishnan, pointed out the two other buildings, one on either side of the Taj, telling us that both are mosques, and are made of the same red sandstone as the walls. Splendid in their own right, they pale in comparison to the central building, and are barely noticed. Staring at that magnificent edifice, it took quite a while for my mind to engage enough to realize that 350 years ago, before settlers were scratching out a foothold in the New World, this culture was creating buildings of astonishing beauty, even by today’s standards. 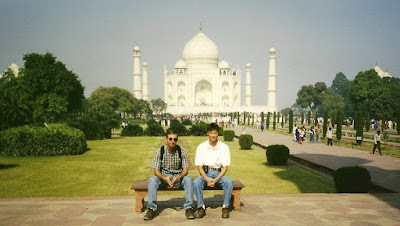 It is a triumph of human achievement.We walked slowly through the garden, taking off our shoes before stepping onto the marble tiled platform that supports the central dome and the four towers placed at each corner of the platform. We walked around the dome, clockwise, and ran our hands over the white marble walls that are inlaid with semiprecious stones in designs that form lovely flowers. The intricacy of the carved stone is breathtaking. Mr. Krishnan informed us that we were seeing the mausoleum at the worst possible time of day. Late morning, the sun hammered down on the white marble with such brilliance that it hurt the eyes and intensified the heat. It was better, he said, to view the Taj in the cool of the early morning, when the building reflected the crimson sunrise, or better yet, after sunset when the marble turns purple with the darkening sky until the moon rises to shade it yellow. Inside the tomb, we found two blocks of marble. The larger one was dead center, directly under the dome, and a smaller one, off to the left. Mr. Krishnan told us that the Taj was built to be the resting place of the Shah Jahan’s wife, but as it turned out, Shah Jahan is buried here too. 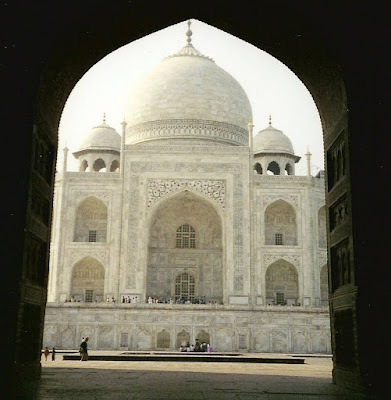 The larger stone block holds the Shah, and the smaller one holds his wife, Begum Mumtaz-i-Mahal. Our guide led us to a food vendor that was selling curries in metal pails, flat bread wrapped in foil, and delicate brown samosas. We bought several samosas and sat on the grass under a shade tree, eating, while Mr. Krishnan told us the building’s remarkable history. 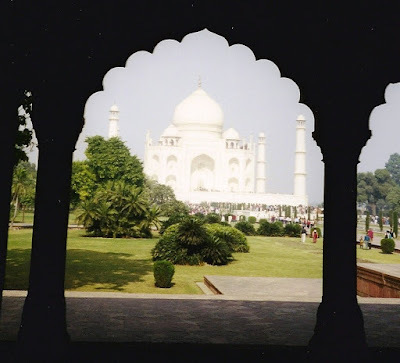 Shah Jahan, Mr. Krishnan explained, meant to build another mausoleum for himself, across the Yamuna River, and identical to the Taj Mahal in design, but built with black marble instead of white. A perfect mirror image, for in that culture a wife was the reflection of her husband. He had planned to connect the two structures with a silver bridge so his spirit could visit his wife on moonlit nights. Such grand passion he must have felt for her. However, when his son and heir to the throne realized that his father had bankrupted the family for his grand monument to love, the son imprisoned his father in a tower of the Red Fort at Agra, and kept him prisoner until his death. 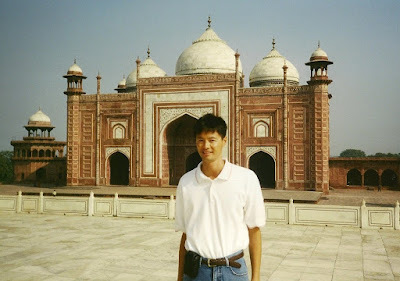 Then the son placed both his parents in the tomb of the Taj Mahal. What a shame that love didn’t triumph over greed, I couldn’t help thinking. As breathtaking as the Taj Mahal is, having that mirror image across the river with a silver bridge connecting them would have been a monument to love for time immortal. Although, when I think back on our visit and the Taj, I think it is fitting that the two lovers lay side by side in the same room, together always. It makes me happy to think of them together through eternity, and that never fails to bring the fragrant smell of warm samosas to mind. The country we have returned to the most over the years, and also spent the most time visiting, is beautiful Thailand. We have been to a number of interesting and fun destinations within this wonderful, predominately Buddhist country: Bangkok, Chiang Mai, the World Heritage sites at Sukhothai and Ayuthaya, Pattaya, and a smattering of islands in the sound. Every destination we’ve experienced in Thailand offers a unique glimpse into a rich Buddhist tradition and an ancient culture, and the country’s distinctive natural and architectural beauty. But one of the most fun and interesting things we’ve ever experience in this colorful nation is the week-long gay pride celebration on the island of Phuket. Phuket is the largest island in Thailand, and also the most popular with foreigners. 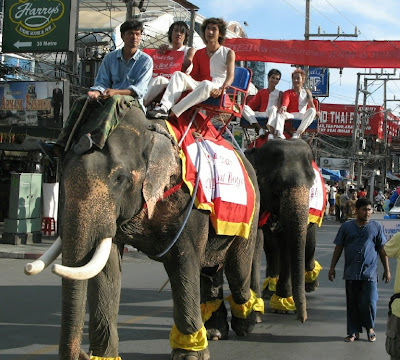 80% of all travelers visiting Thailand spend some, if not all, of their time on Phuket. It is located in the Andaman Sea off southern Thailand, and is mostly mountainous but has numerous find sand beaches. The most popular tourist areas on Phuket are the beaches lining the western coast of the island: Patong, Karon, Kata, and Kata Noi. These areas have easy access to wide, long beaches, and also have Phuket’s most vibrant nightlife and cheap shopping. When Herman and I travel to Phuket, we generally stay at a tiny beach on the extreme southern end called Nai Harn Beach. There are fewer tourists there and no nightlife to speak of, but it’s a great getaway and the locals are charming. It even has a little gay section of the beach where local gay men come to frolic in the water, play volleyball, and watch the radiant sunsets. All the festivities for the Gay Pride celebration, however, take place on Patong beach, the largest and most popular of all Phuket beaches. 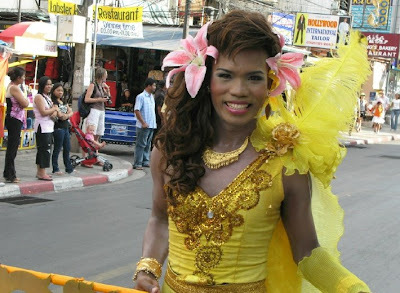 At Patong, most of the gay hotels are packed within a three-square-block area called Boys Town, in the Paradise Shopping Complex. 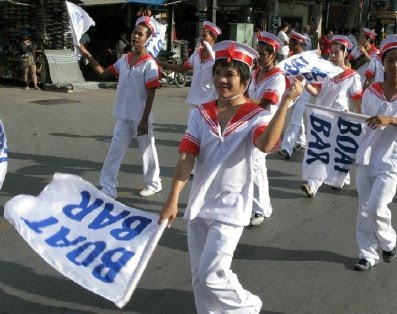 But because the celebrations at Boy Town go on every night until the wee hours, during pride week, we stay at a quiet little gay B&B on the outskirts of Patong call Club One Seven: a pleasant fifteen minute stroll from all the action. 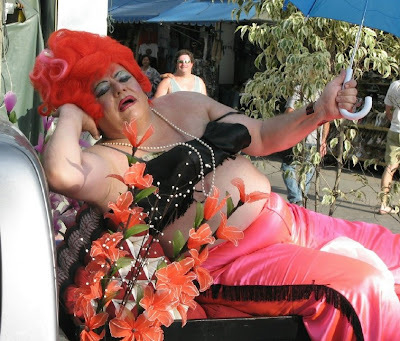 Each of the gay-owned businesses sponsors a float. The procession files down the entire length of the beachfront street and ends at a beachside park where loud music, the great BBQ seafood, and exotic drinks flow freely all day and all night long. Their pride celebration does not happen every year, nor does it happen at the same time of year, so if you plan to join in the fun, check the travel blogs first to insure when the next one will occur. Then don’t miss it!